For more, check out the tags, or go here for Part 1, part 2, part 3, part 4, part 5, and part 6. Let me explain--no, there is too much, let me sum up: The Wraiths, in an attempt to insinuate themselves more closely into ROM's life, presumably to stir up mischief later, replaced Steve Jackson and tried to get Brandy to marry the fake. 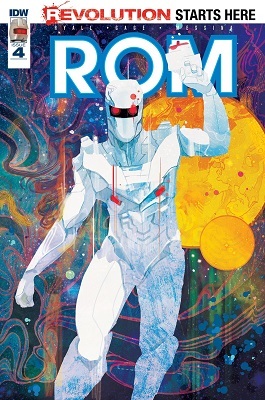 ROM and the real Steve barely broke up the wedding in time, and now many of the people of Clairton, West Virginia, know the truth behind ROM and his mission to earth. Aaron "The Mad Whitaker" Bourque; I've got a twitter, now. I'm not proud. For more, check out the tags, or go here: Part 1, part 2, part 3, part 4, part 5. 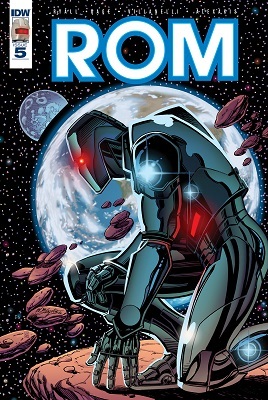 ROM SPACEKNIGHT the comic lasted from 1979 to 1986. The toy lasted from 1979 to 1980-ish. I'm not sure when, exactly, it stopped being produced. The point is, the comic outlasted the toy by a big margin. When the series entered its second year, it was decided that a second feature, about the Spaceknights themselves, would also be appearing in the title. Since the back-up feature was only 5 pages, I . . . won't be showing them in this series, maybe a page here or there. However, the increased pagecount per issue meant that when the Spaceknights back-up wouldn't appear, there would be additional story pages used by the main story! Yay! Granted, this would bring the page count up to 22, but hey, I'll take what I can get. Aaron "The Mad Whitaker" Bourque; oh, that Spaceknight Starshine? Her introduction is one of the most important things in the entire series! Regulated to a back-up story! A five page back-up! That I can't even post! Reurgh. All right, so I've blown my photobucket bandwidth for the month, my first attempt at this failed horribly! So let's see if some other free image hoster works, shall we? Stuff happened. Seriously, read the tags. Oh right, bandwidth exceeded. Okay! Explorers from Galador stumbled across the shapeshifting Dire Wraiths in the deeps of space, who started a war with them. In order to fight back effectively, the Galadorians proposed a radical cyborgization procedure, and a young man named Rom was the first to volunteer. He and about a thousand others got turned into Spaceknights, super soldier cyborgs with fantastic weaponry. 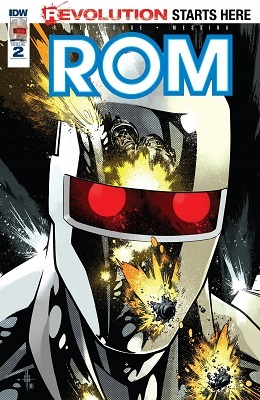 ROM becomes known as the GREATEST OF THE SPACEKNIGHTS after he defeats the summoned beast called DEATHWING. 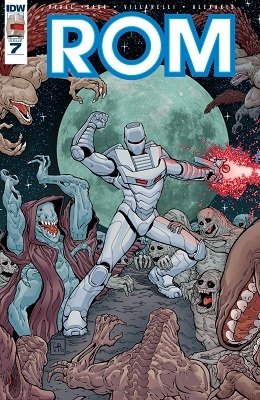 Though the Dire Wraiths were driven off, ROM vows to hunt them down wherever they go. Two centuries later, the trail leads to Earth. Blah blah blah, the Dire Wraiths have infiltrated humanity on multiple levels, yadda yadda yadda, humanity mostly fears ROM because it looks like he vaporizes helpless people when in actuality he banishes them to Limbo, blather blather, only two humans right now know the truth and trust ROM, the massively crushing on him Brandy Clark and her boyfriend (ooh, awkward) Steve Jackson, who in the course of protecting ROM's secrets have been arrested by the local police. Also, ROM's Neutralizer, his main weapon--which he uses to banish Wraiths to Limbo--has been taken by the Wraiths! And some other stuff happened, too! So that's one year of ROM SPACEKNIGHT down. Tune in two weeks from now to see how the comic outlasted the toy! BY BEING GOOD. Aaron "The Mad Whitaker" Bourque; if this doesn't work, heads will roll. 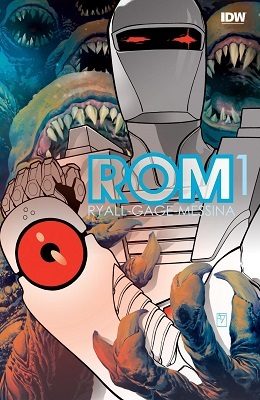 After taking a break last week (I was thinking of making this bimonthly, anyway) we return to the riveting realm of ROM SPACEKNIGHT! Previously, ROM and Steve fought off a pair of unearthly trackers sent by the Dire Wraiths to mess ROM up, which they did. ROM's in a cyborg-coma, Steve's freaking out about how to help and keep him secret, the world's going crazy, cats and dogs living together . . . mass hysteria! So ROM leaves, to get his Neutralizer back. Will he succeed? What new threats await him at Project: Safeguard? Find out next time (hopefully in two weeks). Aaron "The Mad Whitaker" Bourque; I thought I'd gotten the hang of these short issues. I was wrong. Only two issues this time around, so let's get to it. Aaron "The Mad Whitaker" Bourque; short issues, short issues, pack more story than modern issues, though they are longer, how does that work~~~~~~??? Okay, we've got 3 issues to go through today, so let's get moving! Aaron "The Mad Whitaker" Bourque; these issues were so short! 1/3 limit, you're killing me, sheesh. Current Location: Certainly Not In Earth's Orbit! In 1979, the character ROM, SPACEKNIGHT was introduced. It was a toy tie-in comic (something Marvel got heavily into at the time), and despite the toy failing rather quickly, it was excellent. No, seriously, it was a fun super-hero story, it was a reversal of the standard alien invasion cliche of the time, it was a meditation on the meaning of sacrifice, the essence of humanity, and the disconnect between war veterans and the peaceful society that requires soldiers to defend their way of life. And it will probably never be reprinted, because Marvel doesn't hold the rights to the character. Oh, they hold the rights to the villains, the supporting characters, everyone else, but not the title character. Despite this, he's shown up a few times in "stealth cameo" form, never mentioned by name, and usually out of the sleek, iconic bodyshell he's normally depicted in, and there was a (rather disappointing) sequel to his series in the . . . last ten years or something. But it was, as I said, rather disappointing. Anyway, Parker Bros. supposedly still holds the rights, and the rights to his likeness (hence "stealth cameos"), and for whatever reason, they've never allowed Marvel to have 'em back (maybe the licensing fees are just too high? I don't know.) which is frustrating because the comic outlasted the toy by like 5 years, and PB haven't done a thing with ROM since their toy failed. It'd be different if they were trying to revive the toy, or something, but nope. They do nada. Anyway, for a toy tie-in, of a failed toy, need I remind you, ROM SPACEKNIGHT lasted 75 issues, 4 annuals, several cameos (both stealth and non) and in the memories of fans all over. Here he comes.